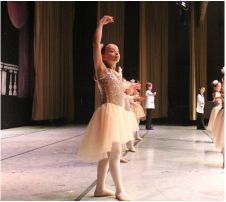 Every month a student of the Integral Ballet School is honored for noteworthy achievements, extraordinary behavior and/or general excellence. These achievements may or may not be dance-related, but show what it means to be an exemplary student of ballet. We love to see our students going above and beyond in every area of their lives. Victoria C is a yellow belt student at Integral Ballet and has excelled since she began studying here in September. She is a hard working student and is focused and energetic during class time. She is helpful to her classmates and peers and is a delight to have in class. We look forward to many more performances from Victoria!